Our program is taught by U.S. Sailing certified instructors who are also certified in CPR, First Aid, and water related safety procedures. Del Rey Yacht Club has over 40 years experience in offering a comprehensive year-round sailing program. Our instructor ratio of one to four for beginning classes exceeds U.S. Sailing recommended guidelines. Michael Hanson: A native of Deephaven, Minnesota. Michael graduated from the University of Hawaii at Manoa with a BA in English and has coached sailing for the past six years in Minnesota, Hawaii and California. Michael served as the Optimist Race Coach for two summers before taking the Head Coach position last year. Erin Petersen: Originally from Sun Valley, Idaho, Erin graduated from the University of Hawaii at Manoa with a MA in Education. Throughout the year she teaches Kindergarten at Our Lady of Guadalupe Parish School. Erin is the Head Green Fleet Coach. Alex Burrow: Grew up sailing in Auckland for the Royal New Zealand Yacht Squadron and graduating from the Youth Training Program. Currently studying Earth Science and on the sailing team at the University of California, Santa Barbara. Alex is the Head Optimist Race Coach. Christopher Weis: Grew up sailing at Del Rey Yacht Club sincethe age of seven and has competed nationally in Sabots, FJs, and C420s. 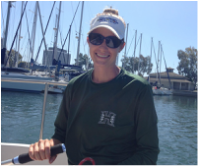 Attends UC Santa Barbara and am an active member of the UCSB sailing team. 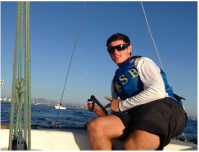 Dylan Finestone: Dylan has been sailing since age 13 and has experience on a variety of dinghies and keelboats. He is a senior attending Loyola High School and is looking forward to his second summer of coaching at Del Rey. More summer Instructor Bios coming soon!